It’s the scenario that haunts us all from time to time: you come home from work, you’re hungry, it’s late, you open the fridge – and there’s nothing there. Maybe the supermarket is closed or too far away, maybe you’re just too tired to go, but in any case there’s no question of acquiring more ingredients. Don’t panic. And don’t pick up the phone to call for a pizza just yet. Do you have any vegetables hidden away at the back your fridge, or maybe in your freezer? If not, I’m afraid I can’t help you, so go ahead and order that pizza. But if you do, you might want to try my formula for concocting a soul-warming soup from the dregs of your refrigerator and cupboards. It’s nearly foolproof, because it allows for infinite variations based on what you have on hand. And I like the results so much I even use it when my fridge is full! I haven’t given any exact measurements here, because everything will depend on the quantity of vegetables you have. The best strategy is to add things sparingly if you’re not sure, and increase the quantity later on if you want more. As far as the stock goes, it’s better to have too little than too much, because you can always add more to thin things out, whereas it can take quite a while to boil off what you don’t want (and you run the risk of things getting too salty with over-reduction). Step 2. The caramelization. This step primes the vegetable to release as much flavor as possible in the soup. For most vegetables, just cut them into manageable chunks (not too small), toss them with olive oil in a roasting pan and put them in a 375-degree oven for as long as they need to get a bit crusty and caramelized. Things like eggplant, peppers, tomatoes, winter squash and sweet potato can be roasted in their skins (peppers, tomatoes and eggplant can even be charred under the broiler if you like) and then peeled before proceeding. I also toss several *unpeeled* cloves of garlic in the pan with the vegetables. When the veggies are nicely caramelized, put them into a heavy-bottomed pot on the stove. Don’t forget to peel the garlic. Step 3. The stock. Honestly, I use bouillon cubes (Not anymore – I use Better than Bouillon! Try the organic chicken. You’ll never use cubes again!). If I had the patience to make homemade stock I would use that, but whatever you have on hand will be fine. Cover the vegetables with the stock so that they’re covered by about a 1/2 inch of liquid. Step 4. The herbs and spices. Fresh or dried – it’s your choice. There are the usual suspects, such as basil, thyme and curry, and untraditional ones, which are only limited by your imagination. Try chipotle chiles, or even chocolate! Toss in as many as you like and let everything simmer until the vegetables are starting to get soft. Step 5. The enhancement. Here is where you can really get creative. Nuts are fantastic here, they add thickness and character without overpowering the other flavors. 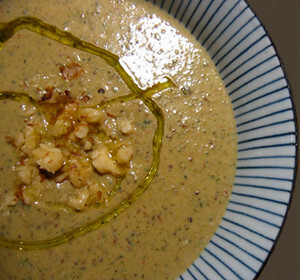 Walnuts, almonds, pecans, hazelnuts, cashews – lightly toast a handful and add them to the soup. Let them simmer with everything else for at least 10-15 minutes. Peanut or other nut butters are also great, as are grated or crumbled cheeses – though I add these just before the final step so they don’t get stringy. Parmesan, smoked mozzarella, cheddar, pepper jack, feta, goat… Something else I’ve been experimenting with lately is booze: brandy, port, marsala, vermouth, sherry… Like the cheese, add a glug or two just before the end. Step 6. The enrichment. This brings it all together, gives the soup some richness and thickens it up. Traditional is of course cream, but there are other possibilities: cream cheese, yogurt, coconut milk, butter… The only thing to remember here is that some of these don’t take too well to boiling, so heat the soup gently after this step. Step 7. The emulsion. If you have a hand blender, this step will be a cinch. If you only have a normal blender, carefully pour the hot liquid into it and cover the top tightly with a towel before you turn it on. Trust me on this one – if you don’t keep that lid down with all your strength, you will have new decor on your kitchen walls! Step 8. The final tweak. Check to make sure the balance of salt is to your liking; think about also whether a pinch of sugar or a squeeze of lemon would enhance the flavors. Correct the seasoning, heat for another couple of minutes, and serve to hungry people in big steaming bowls. I came across The Traveler’s Lunchbox today and just wanted to congratulate you on putting together a terrific site. Great photography and interesting recipes and stories. I live in Chicago and love the food options in this city, but it’s so interesting to read about what you’re up to in Scotland. Nice work. Hi Linda!Thanks for your kind words – especially about the photography, I’ll have to brag to Manuel, since he’s supposed to be the photographer here… Anyhow, thanks for dropping by and giving me some encouragement! this soup looks gorgeous and sounds so tasty. mmm looks scrumptious. im intrigued cauliflower/almond/parmesan one- what a great combination! Now this is my kind of soup! Can’t wait to give it a try this weekend! What a fabulous website – thank you for addressing the casual cook as well as the gormet. WAW. Awesome recipe. I imediately went to the kitchen en tried it! I had bought 3 broccolis for 1 euro on the market today and this was the perfect thing to process them.I did brocoli, marjoram (fresh from the garden! )walnuts and feta cheese with a hint of port and yoghurt.It was awesomely delicious.thank you for sharing!!! Don’t try this version, it was inedible: zucchini, peanut butter, Erzincan tulum cheese, curry spice. I can hear people saying "what were you thinking?". I don’t know. I am usually quite good with these things. This was a disaster. Luckily the focaccia I baked to go along saved the dinner. I love wholesome foods cooked in simple ways…and I’m gonna try cooking soup this way. Thank you for sharing. Everything you suggest, although quite unique combinations, sound very tasty. I love soups… not always. I’m no gourmet, but I do have my likes and not-likes. As a university student I can be (and amLOL) subjected to so many gastronomical blasphemies- horrible soups among them. I originally stumbled across "The Traveler’s Lunchbox" in search of a good gelato recipe, and although I’ve never gotten around to making any, I’ve been a fan of your soup recipes ever since. Your caramelized veggie soup is so satisfying, I sometimes find myself rejecting dinner with bf (a feat only my mother’s cooking could accomplish before^^). I often rush the emulsion and end up stabilizing the soup with starch (bread, flour, even leftover french fries..;) but even then, I love the results. Thanks, Melissa! I made the title soup today in an effort to diminish the pile of zucchini from the garden waiting to be eaten. it would have been perfect except for the fact that one of the zuchs I used had a bitter skin. The other one was very sweet. Should have checked them first. However, I just bought my first can of toasted walnut oil and a swirl of that on top made up for grouchy zucchini. I'm already planning my next version….Thank you!